Here’s an easy and effective way to add some excitement to a website, embed some custom fonts, so they can be displayed in the browser even if they are not installed on the visitor’s computer. There are 2 ways to do this; use a Web Font Embedding Service (see http://www.smashingmagazine.com/2010/10/20/review-of-popular-web-font-embedding-services/ ), or manually add them using the CSS3 @font-face rule. I will explain how to do the second option. First find a font that is not restricted by copyrights, and legal to use and embed on your website. I like http://www.dafont.com/ , it has many free open source fonts, and you may make a donation to the designer. Firefox, Chrome, Safari, and Opera support fonts of type .ttf (True Type Fonts) and .otf (OpenType Fonts), so start with one of these formats. Try to use a fairly efficient font, like less than 200kb. Microsoft Internet Explorer is still the most widely used browser on the Web (39%), and it does not support .ttf nor .otf for @font-face embedding, it requires .eot (Embedded OpenType). Fortunately, there are easy ways to create them. A simple converter can be found at http://www.kirsle.net/wizards/ttf2eot.cgi . It only converts .ttf, and has no options. Another more versatile option is http://www.fontsquirrel.com/tools/webfont-generator . It can convert .ttf and .otf, and has several options to customize the output files for advanced users. There are other converter sites, I’ve used these 2, they’re fast and easy to use. So I finally jumped into the smartphone craze in April, with the MetroPCS HUAWEI ASCEND M860. No it’s not the best, fastest Android cell phone out there, but for me this is a big improvement over my Motorola VE440. I had been thinking about getting a smartphone for a while, then my wife’s old Samsung flip phone started to die, so she got my Motorola (just fine with her, it’s better anyway). We’re both with MetroPCS, so switching phones was easy. So I’m a ‘late adopter’, usually, but ‘better late than never’ (BLTN), right? Anyhow, I am thrilled with this amazing little piece of technology! The Android interface is very intuitive, and navigating through the apps is simple enough. It has taken some reading and learning to get familiar with the device’s many capabilities. Setting up the email service was easy, especially with Google, since it’s their Operating System. The first thing that pleasantly impressed me was the touchscreen keyboard, with its auto-complete feature. I just start typing a word, and it brings up suggestions, which I can scroll to see more, and tap to fill in that word, very cool. It loads with the Swype keyboard, but I prefer the stock Android keyboard, and there are others that can be installed (see http://www.androidcentral.com/android-centrals-keyboard-roundup ). The cool thing about this little green R2D2 is he’s open source, unlike Apple’s proprietary iOS. Android Market has over 200,000 apps with 57% free, Apple App Store has 28% free. 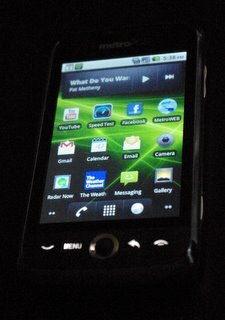 The ASCEND comes preloaded with several apps, a web browser, email, text messanger, calender, music player, many MetroPCS apps, and of course many Google apps (Gmail, Contacts, Maps, Market, Search), and YouTube. There are apps I haven’t used yet. Some of the apps I have installed are Facebook, Speed Test, Weather Channel, TuneIn Radio, USA Today, and Speedx game. Facebook and YouTube are excellent. Since the ASCEND shoots video, I can upload directly thru these apps. It has three video quality settings, 30m low & hi, and a 10m ‘YouTube’ setting. You can see one of my cat Luna at http://www.youtube.com/user/swimsify#p/u/0/5JTN7KyaHH8 . It also takes up to 3.2 megapixels still photos, the quality is ok, but it doesn’t have a flash. ASCEND comes with Android OS 2.1. I upgraded mine to 2.2, but MetroPCS made it a bit tricky. It is worth the effort. I like the look of 2.2, with white text on black backgrounds, and selections a brite orange. The ASCEND comes with a 2GB microSD card, and a Stereo headset with microphone (with mute/pause button). The CPU clocks at 528 MHz, which is about half the speed of the newer, pricier cell phones. My MetroPCS deal is about $50 total (after tax & fees), and includes unlimited talk, text and data, nationwide (although their network coverage is limited compared to the big carriers). One major drawback to the ASCEND is the data speed 1x, which is like the old dial-up speeds, around 50 kps upload & down. That’s ok for emailing, but not much else. Fortunately it has Wifi! Compare this to average download speeds of 3G at 1 Mbps and 4G at 4 Mbps. Looking forward to getting a 4G, when I get ‘a round 2 it.’ For now, the HUAWEI ASCEND at $100 (after $30 mail in rebate), is a pretty good deal, and a fun and productive device.